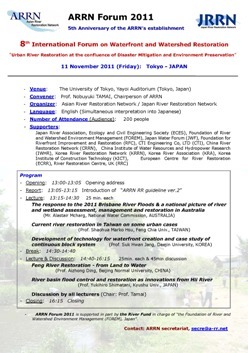 The Asian River Restoration Network was established in Nov. 2006 to support the exchange of information relating to environmental restoration of rivers and watersheds. JRRN has a role of ARRN secretariat currently. Lofty Chuoh Bldg., 7th Flr. In this page, JRRN's major activities, such as event and international exchange, are reported. In addition, general news and event about river environment and restoration are introduced.